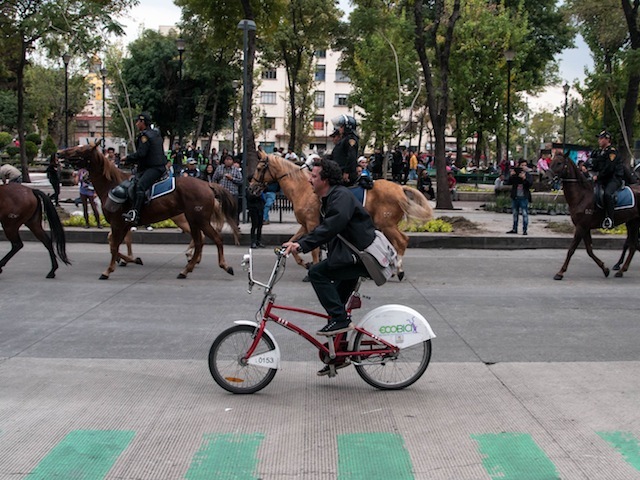 Mexico City’s Ecobici bike-share system is one of the best in the world due to its high usage and integration with city’s overall transport system. Photo by Eneas de Troya/Flickr. Less than ten years ago Lyon, France launched the first successful, modern bike-share system. Less than seven years ago Paris, France put bike-sharing in the global spotlight. Bike-sharing is no longer a novel experiment but a proven mobility solution. From the many different models now in existence, it is possible to harness this data to optimize the various bike-share networks. Understanding the metrics behind a successful bike-sharing program allows cities to understand their systems’ weaknesses and address them. The right research can also provide insight into how cities without bike-sharing systems can expand their transport options with lower risk – a vital step towards promoting sustainable mobility solutions in developing cities. One key challenge in determining how to optimize a bike-sharing system is that systems are created for a variety of different reasons, and “success” can be determined along many different metrics. San Antonio, Texas, for example, sought to reduce high rates of obesity in the area. Hangzhou, China hoped to improve local economic production and employment. San Francisco, California wanted to provide last mile transit access and improve air quality, while Washington, D.C.’s system is designed to promote equity of access amongst neighborhoods. With over 600 unique systems in as many unique cities, researchers are confronted with the challenge of examining myriad systems and honing in on the specific facets of bike-sharing systems that contribute to overall success. Even though there are many reasons to improve a bike-sharing system, at the center of every different reason is one goal: transporting many people efficiently. If a bike-share system is not generating high usage or attracting members of the community, it is not meeting this goal. This idea of many is measured by trips per capita, which is an indicator of market penetration and the intensity of use within the community. Trips per capita are found by dividing the number of trips by the estimation of the population of the coverage zone. If a bike share system’s trips per-capita is low, the system is not having a significant impact on the community. The idea of efficiency is measured by daily trips per bike, which is an indicator of turnover and intensity of use, which is important for both system efficiency and cost efficiency. If bike turnover is too low, the investment in the system will have a low return in terms of revenue and mobility improvement. Consider it equivalent to a public bus that drives around empty all day. Likewise, too many trips per bike could mean that there are not sufficient bikes to meet demand as bikes are continually in circulation. A basic scatterplot of the performance of twenty different systems according to these indicators shows that the mobility performance of different bike share systems varies widely. The graph below identifies cities like Barcelona, Montreal, Lyon, and Mexico City, all of which have managed to achieve both high infrastructure usage and high penetration. With paragons of successful bike-sharing systems identified, it is possible to move forward to exactly what business models, policies, and design strategies these successful cities are using to engrain sustainable transport into their municipalities. With this knowledge, cities around the globe can better learn what actions to take to make a highly used, highly impactful bike-sharing network.